Deveron UAS helps agricultural efficiency reach new heights with a data-gathering drone fleet. New trends in technology are penetrating every conceivable part of our daily lives, and the food on our table is no exception. What many shoppers might not know, however, is that technology is now making a difference right at the very source of our food – the farmer’s field. The agricultural sector is experiencing a rapid digital revolution, with some farms these days run more like high-tech outdoor factories. 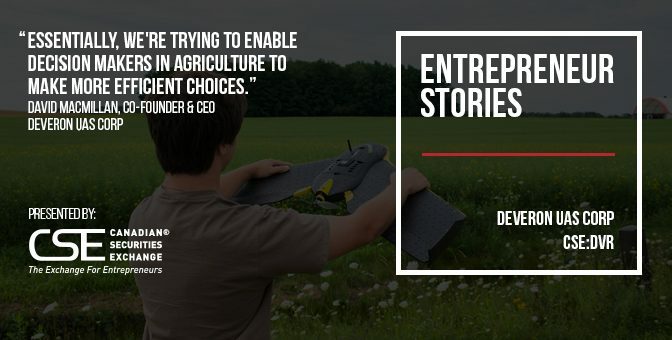 Deveron UAS Corp (CSE:DVR), an enterprise drone data provider targeting agriculture, would thus seem to be at the right place at the right time. 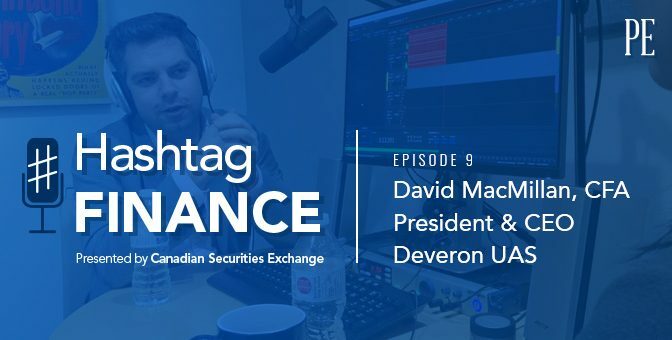 This use of drones, or for the uninitiated, unmanned aerial vehicles, is a nascent industry, yet one where the potential rewards are enormous, explains Deveron’s co-founder and Chief Executive Officer David MacMillan. Put simply, the company’s pilots ‘fly’ farmers’ fields, mainly over mass crops like corn and soybeans, and provide follow-up analysis to help increase yields and reduce costs. Services include thermal imaging, data analysis and drainage identification – in other words, Deveron’s technology is able to tell a farmer what is going on in his field, something that is oftentimes difficult to determine by working strictly at ground level. Macmillan says that in discussing Deveron with potential users, the emphasis must be on explaining the advantages of this new type of analysis, rather than trying to tell people that they’ve been farming the wrong way their whole lives. “Essentially, we’re trying to enable decision makers in agriculture to make more efficient choices,” he says. For farmers eager to embrace the concept, Deveron is one of just a handful of entities with a permit to fly drones across Canada. There are 15 pilots available as and when needed in eight of the country’s 10 provinces (having started in Ontario with just two). MacMillan explains that it makes more sense for farmers to hire Deveron than to buy their own drones at great expense, particularly if field analysis is needed only a couple of times each year (as is often the case). The fact that farmers need to make key decisions on a variety of crop planning issues every year is a strong selling point, both for farmers who might use the service, as well as to investors considering whether to back Deveron with an equity purchase. Currently, the group is targeting large agricultural operations as customers – those which might manage a million acres or more – as well as smaller outfits. At this point, it is all about encouraging a network to develop. While it is still early days, Deveron is already seeing engagement expand as bigger players increasingly sell its services ‘downstream’ to their customers. At present, there are around 30 such partnerships with big farm managers. Recent collaborations include the retail division of GROWMARK Inc., vegetable producer Bonduelle North America and major farming services and grain retailer Thompsons Ltd. Everyone gains in the network, explains MacMillan, as the large entities get Deveron’s services at a discount, and then in turn make some money when they sell it down the line. “There are 400mln acres of farmland in North America so it’s a huge addressable market,” adds MacMillan. Some 88mln of those are in Deveron’s home Canadian market. What could that translate into in dollars and cents? At Deveron’s standard $3 an acre charge, 2-3 flights a year over 400mln acres, and an assumed adoption rate of 20-30%, that’s a potential annual market of $700mln, reckons MacMillan, and likely to increase in the future. For now, though, revenue and earnings are less important to the group than consolidating its first mover advantage by investing and scaling up the business. MacMillan’s background is in public venture capital and he came to research drones three or four years ago after looking to invest in new technology which could be supported by Canadian companies. Rather than obsessing over the ‘flying robot’ concept, he was interested in how data collected by the vehicles could be used intelligently, and agriculture was a good place to start. “Historically, network plays end up having very high IRRs (internal rates of return) for the first people in the space,” he explains. Behind all that, the idea that by 2050, with a global population of 10bln people, the earth’s food security may be an issue if agricultural yields don’t increase only added to the drive to establish the company, he says. Business partner and co-founder Norm Lamothe is himself a farmer and manages 500 acres of land, so is ideally placed to know what famers need and want. If valuation is any guide, it would seem this combination has the company heading in the right direction. From around $2mln in 2016, Deveron is now worth nearer to $8mln, and recently raised $2mln, says MacMillan. The idea now is to continue to grow organically, scale up the business and gain credibility via more collaborations and partnerships. Canada is the focus for the time being, but to increase the amount of drone flights possible (they can’t fly fields in the snow) developing more of a presence south of the border is appealing, says MacMillan. There is also the possibility of news flow over the next year around further partnerships, new revenue streams, and intellectual property value related to the company’s analytics technologies. The seeds now planted, careful nurturing of Deveron’s business has the potential to yield robust returns for shareholders in the years ahead. This story was originally published at www.proactiveinvestors.com on August 15, 2017 and featured in The CSE Quarterly. Learn more about Deveron UAS at http://www.deveronuas.com/ and on the CSE website at http://thecse.com/en/listings/cleantech/deveron-uas-corp.